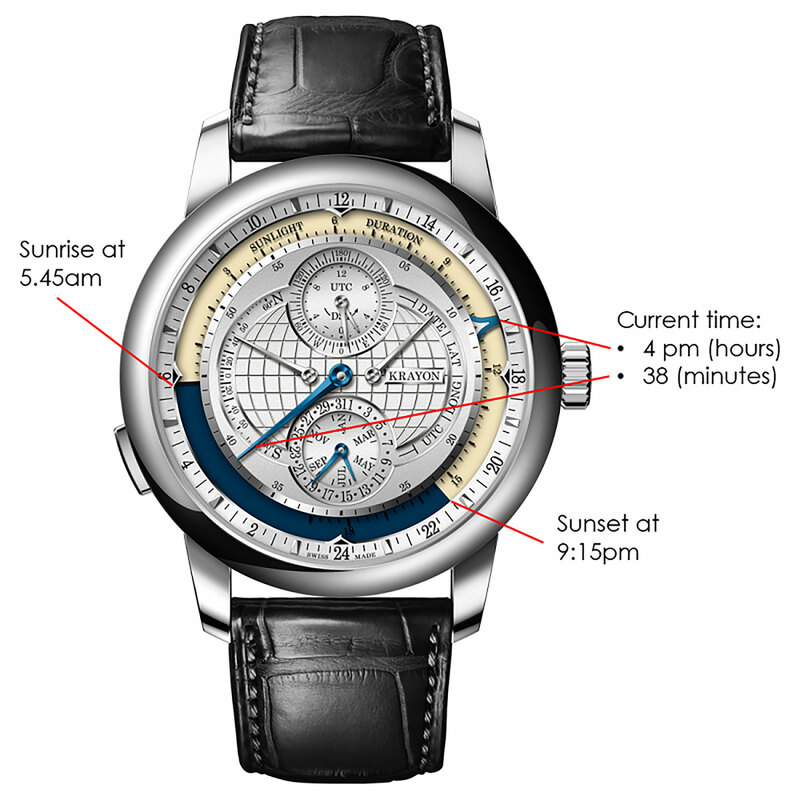 The idea is simple: a mechanical wristwatch that computes sunrise and sunset times. How hard can it be to execute? Deceptively complicated, as it turns out. 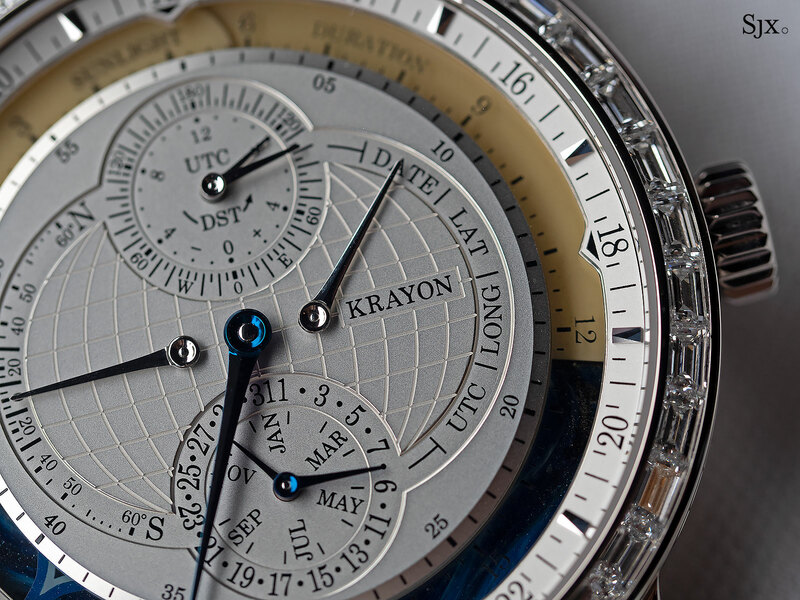 Nevertheless, that didn’t stop Rémi Maillat, founder of Krayon and inventor of the Everywhere wristwatch, from doing just that – and in a completely different manner from any other mechanical timepiece on the market. Watches that indicate sunrise and sunset times are uncommon to begin with, and are usually paired with other astronomical complications, most often with perpetual calendars. Examples include the Audemars Piguet Royal Oak Equation of Time and the more recent Ochs und Junior Day/Night. Then the obvious question: what sets the Everywhere apart from its peers, especially when it costs over half a million Swiss francs? Even within the realm of esoteric complications, the Everywhere incorporates an intriguing and inventive technical feature that strongly differentiates itself from its peers. The intention of this article is to explain how the Everywhere accomplishes what it does, and why that is an immensely difficult task to begin with. The mere part count of the Everywhere movement is staggering – 595 components – all of which essentially to perform a single function. 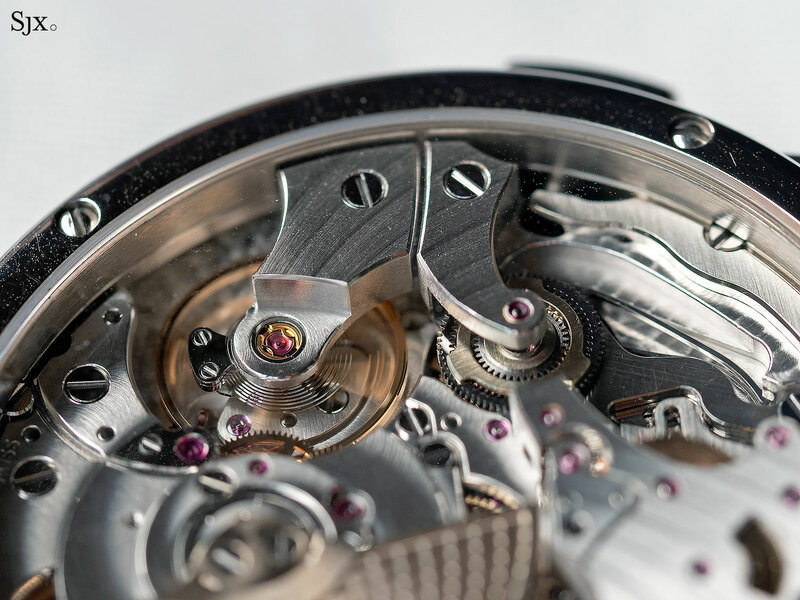 It’s a vastly unique mechanism with a complexity that puts it in the same class as traditional grand complications. But its function is decidedly non-traditional. It is the only wristwatch, as of writing, which can universally compute, on demand, sunrise and sunset times regardless of the wearer’s location on Earth. All the wearer needs to do is to tell the watch a location, by setting the latitude and longitude via the crown and pusher. The ability to change location on the fly is completely unique. 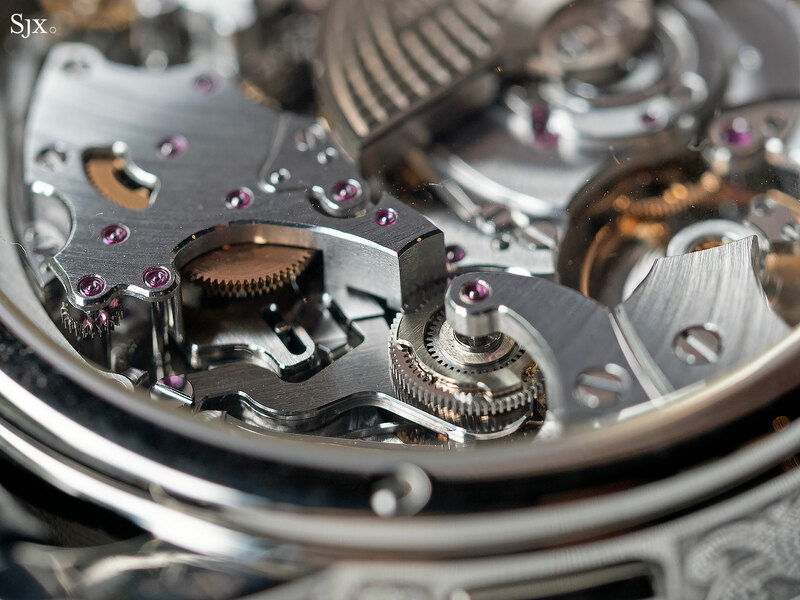 Other watches with similar complications require the wearer to personalise a single, fixed location before the watch leaves the factory; that’s because the mechanism relies on a specific set of parts tailored for a single location. 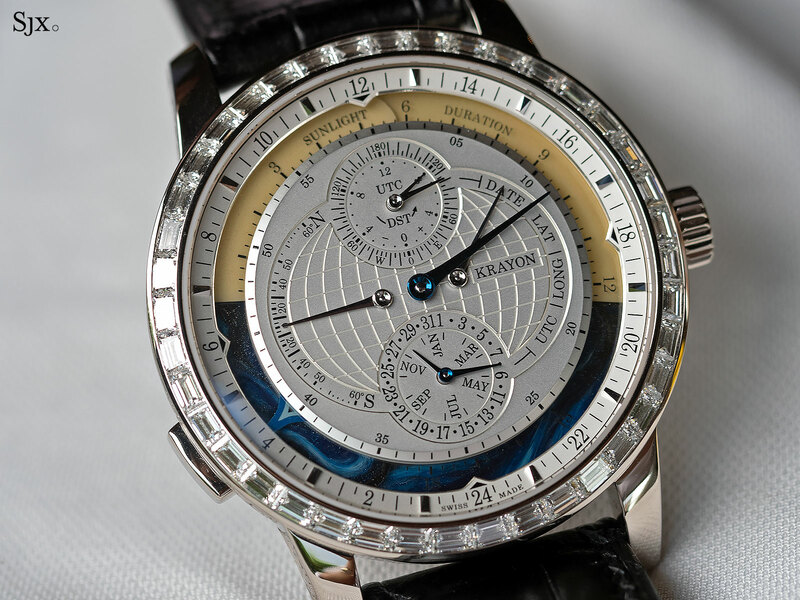 The Audemars Piguet equation of time watches, for instance, are each customised for a specific location, and indicate the city and time zone on the bezel or dial flange. This is naturally limiting, since such a watch only works for the city built into the movement; any change in location requires the watch to be returned to the manufacturer for modification, presumably at a significant cost. But to fully appreciate the Everywhere requires more than just understanding the remarkable mechanical versatility of the movement. It also requires exploring a handful of astronomical concepts, such as why days are shorter in winter, or why countries around the equator don’t have seasons, and consequently days and nights of equal length. What affects sunrise and sunset? Integral to the Everywhere, but not displayed explicitly on the dial, is an equation of time mechanism, which in conjunction with all the above is used to calculate the sunrise and sunset times. The appendix covers an in-depth explanation of these astronomical concepts such as why the Earth has varying sunrise and sunset duration and times depending on different locations. All four of these inputs can be adjusted via a pusher selector and the crown. The pusher cycles through the above four as indicated by a retrograde hand, whilst the crown allows adjustment forwards and backwards on demand. The key display of the dial are the sunrise and sunset times that are indicated by a novel method – using a bi-colour wheel on the periphery of the dial. The wheel actually consists of two painted, overlaid discs, with yellow indicating the day and dark blue for night. These discs operate across a full day, or a 24-hour cycle, and have teeth on their inner rim that are driven by the movement. By rotating the discs relative to each other, the watch creates a visual representation of a longer or shorter daytime period, and vice versa for the night time. This changes with the seasons, so for instance during summer the yellow portion will account for more than half the wheel, indicating long days, while in winter the converse happens. Superimposed on top of the wheel is yet another disc with the hour hand, taking the form of an arrow, which indicates the hour on a 24-hour scale. When the hour hand crosses the boundary between the yellow and blue portions of the wheel, that is the moment when the sun sets and the day visibly changes to night, or vice versa. This is as intuitive as a day and night indicator can possibly be. 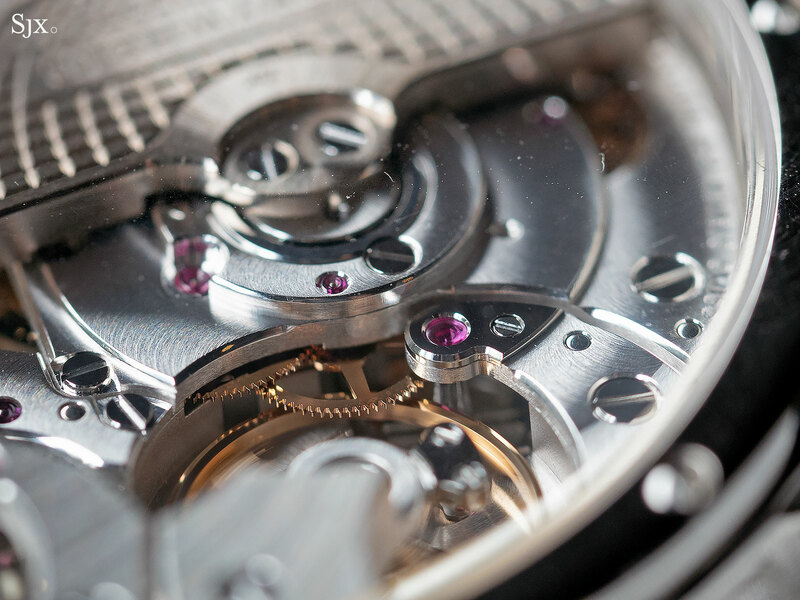 The $500k question then follows – how does the movement control these discs? Well, it accomplishes that with 595 components. But before we go into how it works, we need to understand a fundamental type of gear that is central to the operation of the movement. A differential is a set of gears that averages out the difference between two rotating shafts and transmit the averaged output to a third shaft. It is found in many mechanical devices, from automobile transmissions to the power reserve indicator on watches. A planetary gear is a subset of the differential, getting its name from the fact that it is composed of one or more gears orbiting around another gear. Picture a rotational input shaft going into the differential gear; the system then provides a rotational output (in the Everywhere the output is used to drive the sunrise and sunset discs). What the differential allows is a second input – in this case, as a correction factor – to alter the output. In the context of the Everywhere, the differential gears are used to incorporate the correction factors such as latitude, longitude and time zone into the sunrise and sunset discs. The differential is a very flexible mechanism because of the multitude of implementations possible. Planetary-type differential gears are often used in watchmaking for their compactness as the gears can be arranged on a flat plane. 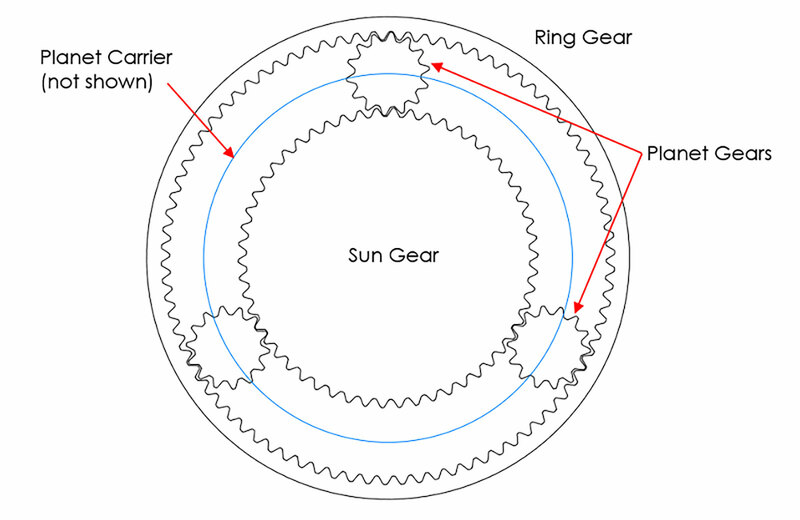 A typical planetary gear has three shafts, comprised of a central Sun gear, a planet carrier ring (omitted in diagram for clarity) which houses a number of planet gears, and an outermost ring gear. Depending on application, any one of the three can be an input or output gear. 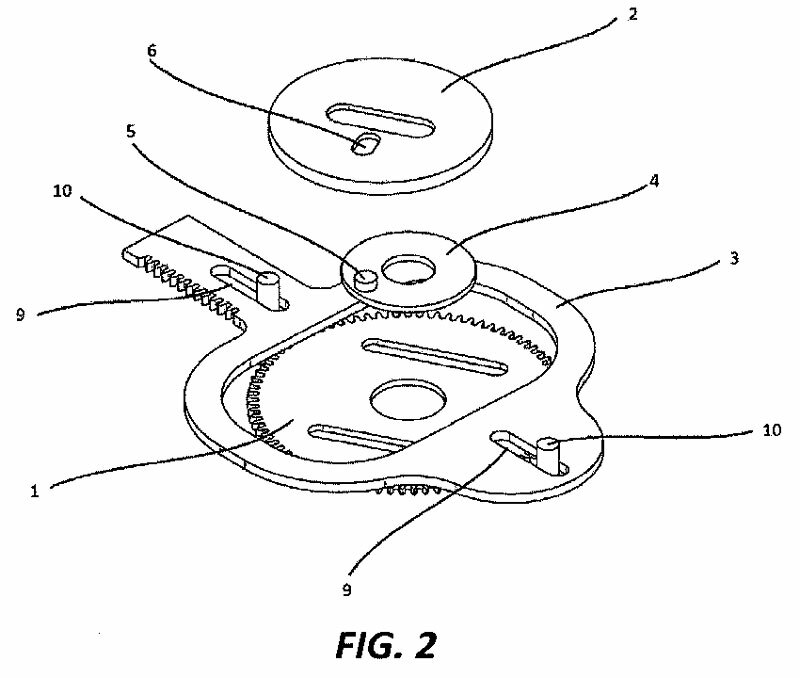 In total, four sets of planetary gears are employed in the Everywhere, forming part of the calculator mechanism. For any wristwatch, there has to be user input (via the crown and keyless works typically) to set the various functions, like the time and date. The watch then keeps track of the time and displays the correct date and time as the output. To understand the movement more easily, the components can be separated into discreet groups. 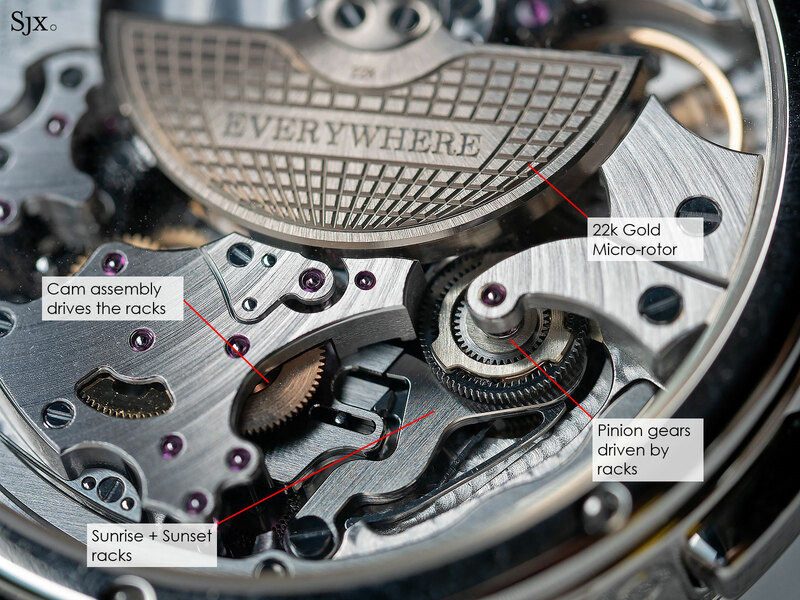 The basics are the crown and keyless works that adjust the watch’s date and time. But it also has a third input, the selector pusher that allows cycling between the date, latitude, longitude and time zone setting mechanism which can be controlled by the crown. The consolidation of all four indicators into one pusher makes for a clean case design, while also making it simpler to operate. The most important mechanism is the sunrise and sunset calculator, which comprises of a plethora of components. Namely, it uses in the date, latitude, longitude, and time zone to figure out how much the sunrise sunset discs should rotate, thus indicating the sunrise and sunset time on the dial. Within the calculator itself, there are actually two separate gear trains – one for the latitude and date on the back, while the other for longitude and time zone under the dial. The key component here is the rotating cam (in purple), with the pivot holding the cam made invisible for a clearer illustration. Essentially a non-round disc, the cam is actually shaped to follow the orbit of the Earth, or the equation of time in other words. That means a day is not always exactly 24 hours, a consequence of the Earth’s orbit eccentricity and obliquity. The cam makes a full revolution once a year, rotating very slowly over 12 months and pushes against a rack sideways by varying amounts based on its shape. The cam drives two racks in the Everywhere, which in turn rotate two co-axial pinions at the top right. These pinions are responsible for moving the sunrise and sunset discs back and forth. Thus the cam has two levels, with each level shaped slightly different to drive each rack. The rack and cam setup is also how a typical sunrise and sunset or equation of time display operates. 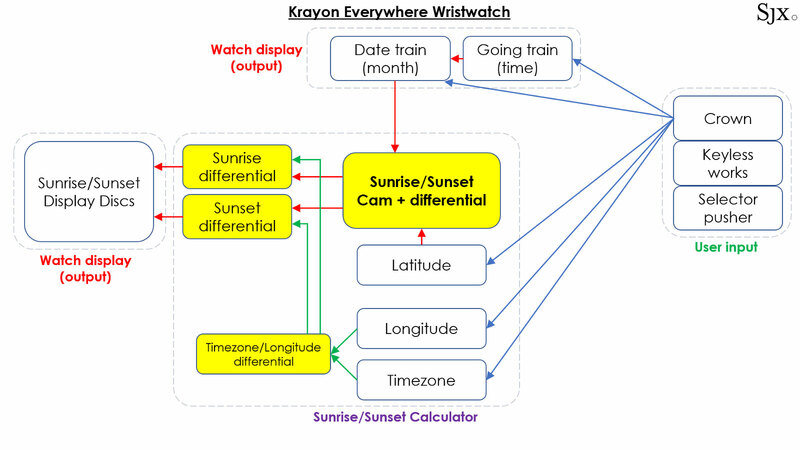 However – and here lies the magic – the Krayon mechanism can be adjusted to show the sunrise and sunset relative to the wearer’s position on Earth. That is entirely unique and is the key selling point of the watch. The ability to adjust the mechanism is because the cam can slide inwards or outwards to represent latitude change, thanks to a horizontal slot down the middle of the cam. Sliding the cam further out increasing its eccentricity (or offset from the centre) represents movementaway from the equator, thus increasing the latitude. In the above animation, maximum latitude is shown and the cam swings around the most. This drives the sunrise and sunset racks to their furthest positions, which correctly represents how sunrise and sunset times vary more as latitude increases. Mr Maillat has filed a patent for this cam mechanism (under the patent of “Device for a mechanism for calculating astronomical phenomena”), which is an ingenious setup that relies on a differential. The differential uses the latitude setting (which is operated by the crown) to adjust the eccentricity of the cam. The animation below shows how the latitude setting controls the offset of the cam (which is again,in purple). 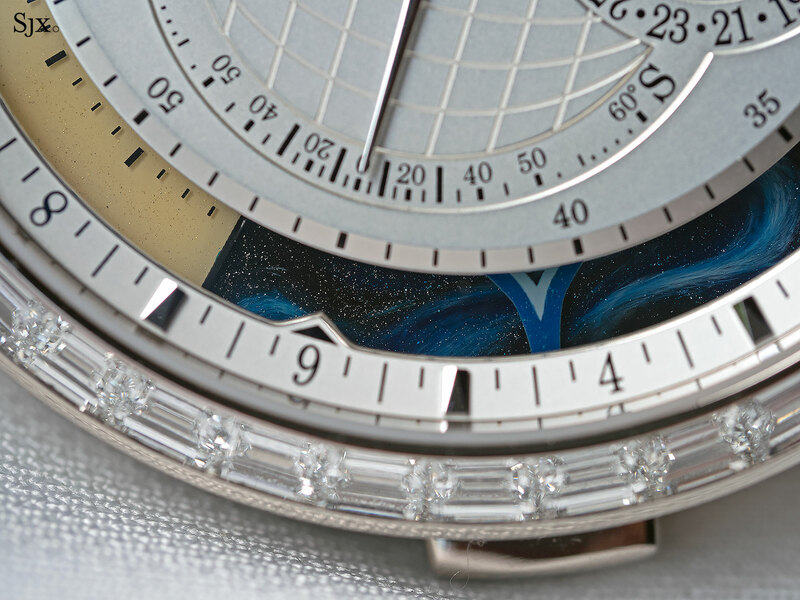 The cam and racks are located on the rear of the watch, and are just barely visible through the case back. Notably, despite the incredible intricacy of the complication, there is still room in the movement to accommodate a 22k gold micro-rotor and automatic winding mechanism, while keeping the overall thickness of the case to just 11.7mm, which is impressive. That comprises the bulk of the mechanisms found on the back of the watch, alongside the automatic winding mechanism and regular timekeeping train. 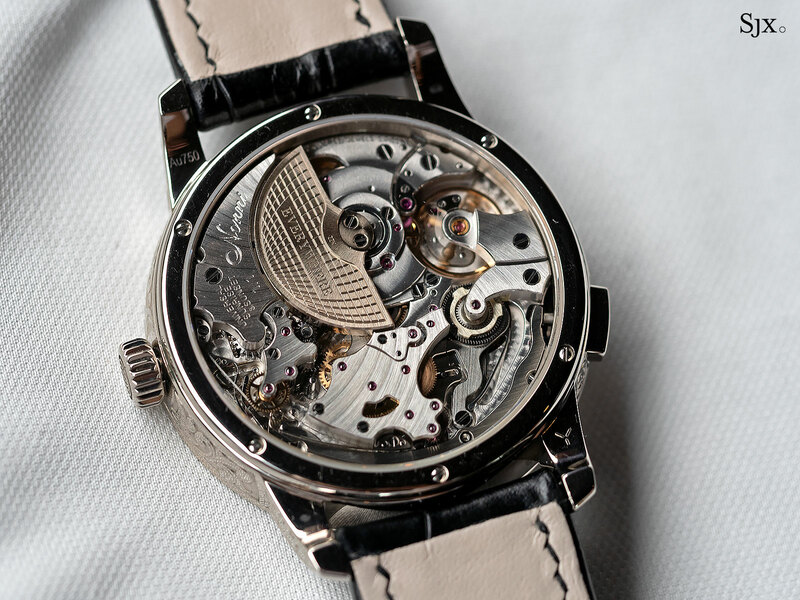 The remaining complexity lies on the dial-side of the watch, and is largely invisible from the case back. While the mechanism described above addresses the issue of latitude, there remain longitude and time zone. Each location is assigned a time zone such that around 12:00pm, or high noon, the Sun is approximately at its highest point in the sky. A large enough country can have several time zones within its borders; Russia, for instance, has 11 time zones. But for practical and economic convenience, nations occasionally unite the whole country under one time zone, meaning the position of the highest position of the Sun isn’t at 12:00pm. China spans across five geographic time zones (UTC+5 to UTC+9) but the entire country runs on Beijing Time (GMT+8). Consequently, this raises challenges in determining the time of sunrise and sunset. Westernmost China will see sunrise five hours faster than its easternmost portion, yet the clocks will display the same time from one end of the country to the other. Consequently, these factors have to be corrected for in both the sunrise and sunset discs. The solution is, once again, differential gears. The addition of longitude and time zone control significantly complicates the movement. 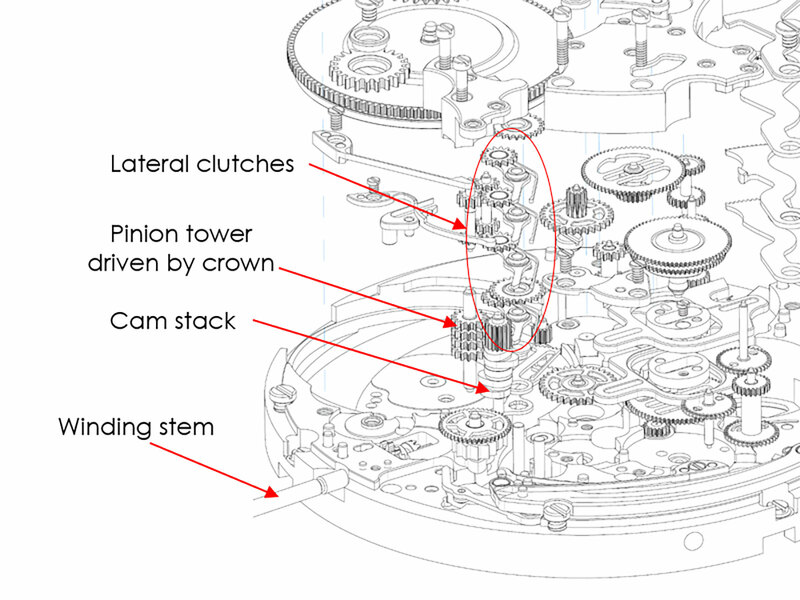 Due to space constraints, these mechanisms have to be added onto the dial side of the movement. Specifically, a pair of differentials are inserted between the racks driving the sunrise and sunset disc pinions respectively. Both discs can now be advanced forwards or backwards via their respective differentials. The two differentials are corrected simultaneously via a gear train under the dial that corrects for longitude and time zones. Intriguingly, Mr. Maillat has designed both differential gears to sit co-axially, stacked up into a “tower”, for compactness. Friction management is key, he adds, as this complex, tower-like structure consists of many individual tiny components that make up the planetary gears, needed to drive the relatively large sunrise and sunset discs. 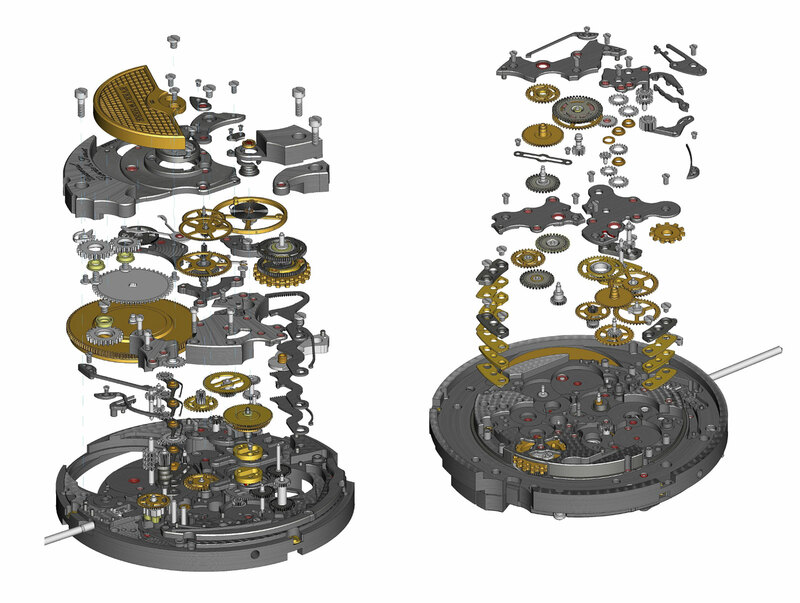 The single gear train that handles time zone and longitude is located on the dial side of the movement, as seen in the animation below, which shows longitude being corrected for. On the left, the differential gear tower can be seen rotating the sunrise and sunset discs. On the top right (in blue) is part of yet another differential gear (the three planet gears rotating in the structure are just barely visible). This one calculates the difference between longitude and time zone adjustment, and transfers the result into the long gear train all the way to the left. This is because longitude and time zone effects cancel each other out when adjusted in the same direction – an increase of longitude (i.e. moving eastward on the globe) of 15° is, in effect, the same as an increase of one-hour in the time zone offset. A little quirk mentioned by Mr. Maillat – the time zone hand moves in discrete steps thanks to a jumper. However, instead of the conventional one-hour steps of most dual time zone watches, the adjustment can be done in 30-minute steps, allowing the time display to account for countries with half-hour time zone offsets, like India that is UTC+5:30. It is also worth detailing how the selector pusher and crown work, allowing a single, conventional crown to control the multiple functions of date, latitude, longitude and time zone. The compact solution employed in the Everywhere is a separate clutch for each of the four functions. A stacked tower of four cams, which are each offset and rotate in steps of 90°, is driven by a single pusher. These four cams sequentially engage and disengage the clutches, such that only one gear train clutch is connected to the crown at a time. Turning the crown then allows for setting of the respective function as indicated on the dial function indicator. That in turn relies on a fifth cam that sits on top of the pinion stack, which drives a retrograde hand that displays the current function in use. These videos illustrate Mr Maillat adjusting the various functions on the watch via the pusher and crown, showing how straightforward it is, despite the mechanical complexity behind it. With such an intricate combination of components for the sunrise and sunset complication, friction becomes a huge consideration. Thus, Mr. Maillat is keen to point out the design of the gear trains themselves were carefully thought out. For one, play between teeth and backlash of the gears had to be reduced, especially since there are many gears in the complication gear train. Otherwise, play between each wheel cumulatively adds up, quickly resulting in wobbly motion and inaccurate positions of the hands and discs. 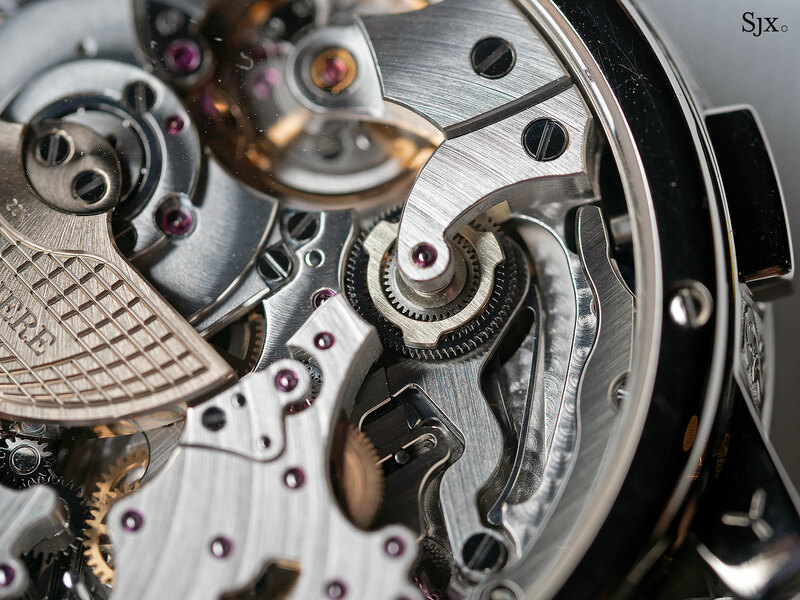 Secondly, friction has to be carefully managed, especially in the differentials – which house many tiny components within – to ensure the mainspring can adequately power all of the functions while still providing enough energy to the escapement to keep good time. Last but not least, the discerning reader might question at this point: is this watch an annual or perpetual calendar? The answer is neither – this watch only functions as a simple calendar, which means that the date has to be adjusted at the end of the month in February and for 30-day months. Mr Maillat says this was actually a deliberate decision, as it allows for the quick and simple setting of date either backwards or forwards. Furthermore, adding a calendar complication would have required additional components, requiring additional energy to function while also increasing the height of the movement, which would have made the watch uncomfortably thick. Exploring the intricacies of the Everywhere reveals a careful level of design and engineering that has created the only wristwatch able to function as a universal sunrise and sunset calculator. That arguably puts this timepiece up in the category of a bona fide grand complication. Despite that, everything is packaged in a relatively compact, 42mm by 11.7mm case that is of Mr Maillat’s own design, boasting an elegant profile and lugs. Add to that the simple user interface of just a crown and pusher, a surprisingly intuitive dial, and it is a haute horlogerie wristwatch both mechanically intriguing and unique, yet very wearable. 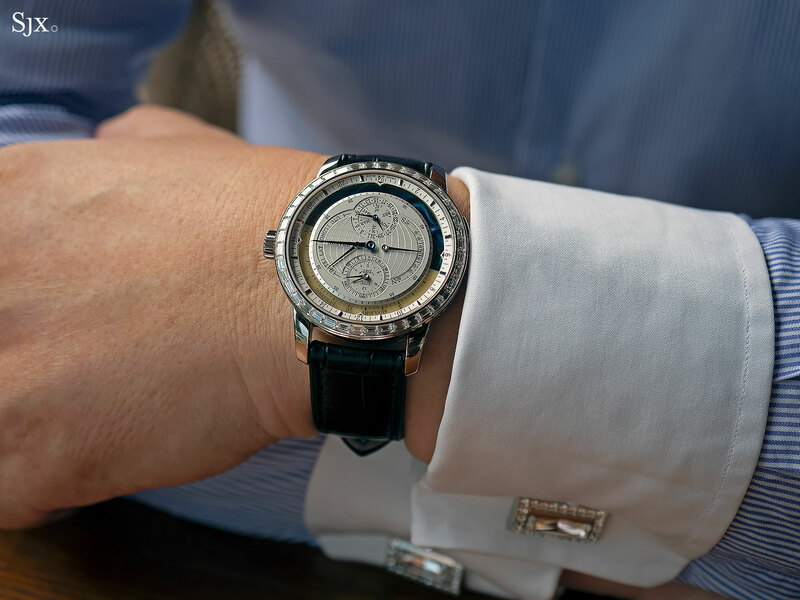 The Everywhere plants itself firmly within the upper echelons of horology with an astronomical price tag. It starts at SFr600,000 with customisation being extra. Mr Maillat says a maximum of five can be produced each year, though the current pace is closer to two. Convention dictates there are 24 hours in a day. However, what exactly is a “day”, and how was the term coined? The “day” that we are accustomed to is technically a “mean solar day”. This is the 24 hours during which the Sun returns to approximately the same spot in the sky, as the Earth makes a full revolution on its axis. But the Earth does not only rotate on itself, it also slowly orbits around the Sun. 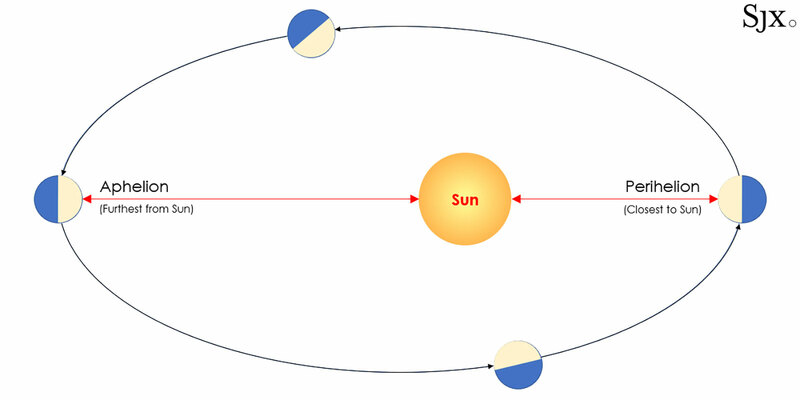 Due to the effect of the Earth’s orbit around the Sun, the position of the Sun in the sky will appear to “drift” daily based on the 24-hour mean solar day. That means at the same time each day, the Sun will gradually be at a different position in the sky. Hence, we need a slight extra rotation of approximately 1° to account for this; which is the mean solar day that we are familiar with. Mean solar time of a 24 hours day is an average, so after the Earth makes a complete revolution around the Sun (taking 365 days, or 366 in a leap year), the position of the drifting Sun will return approximately to its initial position in the sky, 365 days ago. But because it is an average, the Sun’s position will drift day to day. The Earth doesn’t orbit around the Sun in a perfect circle; instead, it orbits in an ellipse. Furthermore, one end of the elliptical orbit is closer to the Sun, known as perihelion, where the Earth orbits relatively faster. Conversely, on the opposite end of the ellipse, furthest from the Sun, the aphelion, the Earth moves relatively slower. This implies that after 24 hours, the observed position of the Sun in the sky will drift slightly; arriving at the same fixed point either earlier or later, thus shifting the sunrise and sunset. Hence, a correction factor is needed. The Earth is tilted at an angle (23.5°) relative to its orbit around the Sun. This alone results in significant impact to Earth in a number of ways. First, it results in the occurrence of seasons on Earth. Due to different levels of sunlight in the Northern or Southern Hemisphere, the side receiving more sunlight experiences summer, and likewise winter for the opposite end. The above animation is an example of the Earth late in the year, where the Northern Hemisphere experiences winter while the south undergoes summer. By tracing the blue dot on Northern Hemisphere, it is exposed to less daylight in a 24-hour period, while the Southern Hemisphere receives more daylight. Six months later, the Earth’s tilt reverses the phenomenon, flipping the seasons and length of daytime – picture the above animation but with sunlight from the right instead. The Northern Hemisphere then experiences summer with longer days, whilst the Southern Hemisphere gets winter. The second effect of the Earth’s tilt – and importantly for this wristwatch – it alters in the duration of sunrise and sunset depending on latitude. This is a geometrical consequence of the Earth’s tilted axis and can be again, visualized in the above animation. The further away from the equator, increasing latitude in other words, the larger the difference between day and night time. Notice how the latitude of 25° experiences almost equal day and night cycles, while the latitude of 45° has a more extreme difference between day and night duration. Of interest is that the Equator, at latitude 0°, is unaffected by the Earth’s tilt effect and has approximately the same 12 hours of day and night time respectively, all year long. On the other extreme, this also infers that the true North and true South Poles experience a full six months of day and night, because the poles are always either exposed or shrouded from the Sun regardless of the Earth’s rotation. Due to mechanical limitations of the bi-coloured discs of the Everywhere, it is not possible to account for these extreme latitudes. That means the Everywhere covers locations within ±60° latitude, which realistically covers nearly all meaningful locations on Earth, except for the extreme Northern regions of the continents, and Antarctica. The combination of eccentricity and obliquity results in what is defined as the equation of time. It is often represented as a graph, or a tabulation of the daily difference, in minutes, between apparent solar time (based on the visible position of Sun in the sky, and what is shown on a sundial) versus the mean solar time. This was an especially important development in earlier periods when the Sun was used to tell time, prior to the invention of modern clocks. It is important to note that Equation of Time is the same regardless of latitude on Earth. In the Everywhere, the equation of time is used only internally to calculate the sunrise and sunset times. 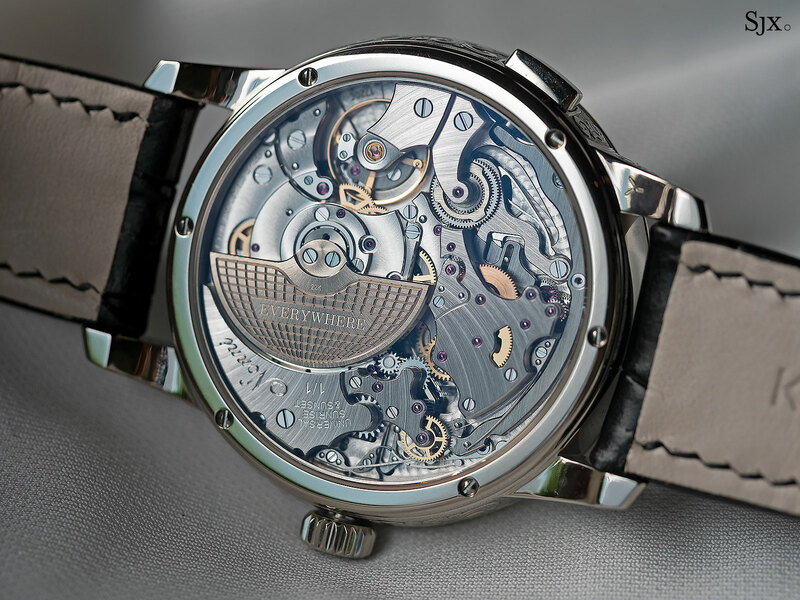 For the inquisitive reader, Andrew Hildreth had also covered similar topics in a separate article on the Vacheron Constantin Celestia. Remarkably complicated albeit cheerily optimistic.